We are currently in Christchurch with some down time as we wait for some repair parts. It’s giving me time to work on some videos. I’m starting to edit the next Kiwi Chronicle episode and lamented all this great Frocks on Bikes footage that probably will be cut from it. So instead of just letting it gather digital dust, I had to cut a Kiwi Short. I was feeling pretty down about cycling in New Zealand and Wellington in particular after the International Bike Incident. This gave me some hope again. Everyday cycling in NZ seems to be in its infancy and its groups like Frocks on Bikes that will hopefully help take bicycling from recreation and bring it back to the everyday. In the video is Leah Murphy, one of the founders of Frocks on Bikes which has become a national movement of sorts. Also present is Celia Wade-Brown, the mayor of Wellington. As you can tell from the video is that it was pretty windy. What you probably can’t tell is how absolutely terrifying the ferry ride was. The seats in the ferry weren’t bolted down and actually started moving during the ride from all the tossing! Everyone was pretty ecstatic to be back on shore and we all decided that riding a few hours into the headwind was more enjoyable than another ferry crossing. What was suppose to be a short picnic ride, turned into some epic riding battling the winds back into Wellington. At one point, three people in front of me and myself included were actually blown into traffic. We got off and had to walk a 100 meters. Surprisingly, everyone kept their spirits high and made it back. Even Celia pedaled all the way back, proving to be a stout cyclist (now if she can only get some more bike lanes in Welly!). Riding with the Frocks, renewed some faith that I had lost in cycling in NZ. It still has a long way to go, but moments like this give me hope. More Frocks on Bikes video goodness: the Wheel Stylish 2012 cycle chic fashion show http://cyclingwellington.co.nz/2012/01/ride-your-bike-to-work-on-wednesday/ and the 2011 Love to Roll Valentine’s Day Ride http://www.youtube.com/watch?v=dhYeqnIusIs. Can’t wait for this year’s Love to Roll! I just started reading your blog, and it looks like your ride was a success, despite the wind! I live in Amsterdam and am intrigued by how cycling is elsewhere as here, the majority of people cycle–it’s transportation, pure and simple, not a particularly social activity. 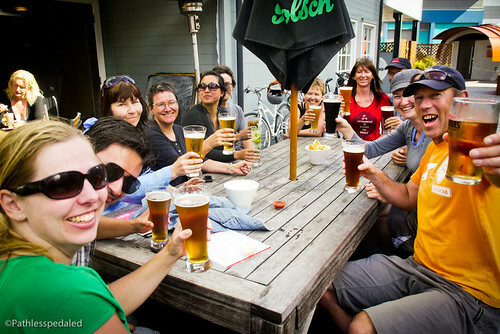 What interests me is seeing the enthusiasm and community that has developed around cycling in places such as New Zealand. You really need like-minded people to support your efforts to cycle when the norm is driving. In that regard, I see such groups as pioneers because they are going against the grain, but creating something useful, sustainable and fun. Hope you are enjoying your travels and thanks for the post! Think you’re blessed on West Coast.These are the conditions most of us bikies have to cope with.Winds,wet,w****er drivers. Re:luggage,have you got drybags for proper rain? Hey Russ, love following along. Video editing question, where do you find the audio for all your videos? I was also wondering how did the dog do with the longer way home?